Pentagram Singer Bobby Liebling Profiled in "Last Days Here"
Editor’s note: This review was originally published during the 2011 SXSW Film Festival. “Last Days Here” opens in limited release this Friday. 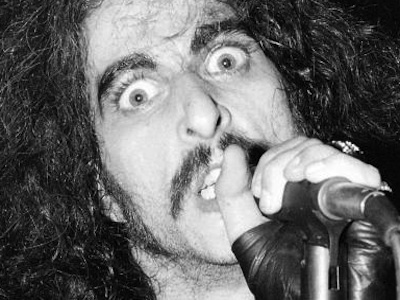 The first time that Bobby Liebling–the frantic, drug-addled frontman of the seventies heavy metal group Pentagram–appears in “Last Days Here,” he looks like a walking corpse. Don Argott and Demian Fenton document the depraved singer-songwriter, still living in his Virginia-based parents’ “sub-basement” after several decades, in grotesque physical terms. Wrecked by debilitating addictions to heroin and cocaine, Liebling barely survives even with several supporters by his side. When a longtime fan and manager insists that Liebling reunite with the band, he hesitantly plays along, but always seems on the brink of catastrophe. His eventual return to the stage is less about making a comeback than simply staying alive. Described by one Liebling colleague as “a frozen caveman who still has active DNA,” the jittery rocker insists that music and drugs provide him with all the fuel he needs. Liebling’s elderly parents support his assertion, strangely enabling their son’s grimy lifestyle and praising his creative abilities. Rounding out the unusual Liebling posse, the singer’s cheery girlfriend–young enough to be his daughter–drifts in and out of his life. A combustible, rambling maniac, Liebling is the star of the show, but the story feels unfinished. Almost exclusively set in the present day, Liebling’s struggles lack a cogent origin story or enough outside voices to contextualize the talent that the onscreen fans take for granted. Culminating with his well-received performance at New York’s Webster Hall, “Last Days Here” implies that the rocker has finally figured out what to do with himself, a result that leaves much to be desired once the credits roll. HOW WILL IT PLAY? With a music-friendly distributor that could coordinate screenings with Pentagram performances or other Liebling performances, “Last Days Here” could do decent business if metal fans turn out for it. Larger crowds won’t have any interest.